As anybody who has properly internalised their Economy 101 and Evolutionary Biology 101 classes I have a strong inclination towards libertarian philosophy. I have almost Hayekian distrust for central planning (incidentally, I grew up in Ostblok) and almost Dawkinsian fascination with autonomously evolving systems. However, every time I become too enthusiastic about all that I remind myself of centrifugal governor and calm down a little. 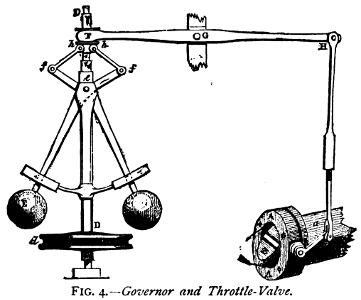 Centrifugal governor is a device, first added to the steam engine by James Watt himself. It controls flow of steam to the valves and thus allows the machine to maintain constant speed. It's powered by the machine and as the machine goes faster it makes the spindle rotate faster, thus lifting the attached masses which in turn connect to the throttle valve which then limits amount of steam admitted to the valves. In short, it's a self-regulating system. And while, like all good libertarians, I would hate travelling by a train with centrifugal governor disabled or missing, I would also hate to travel by one where the crew believed that centrifugal governor is a god-sent solution for all problems and refused to steer the train. In other words, self-regulating mechanisms, as great as they are, aren't omnipotent and work only when some basic assumptions are met. In case of centrifugal governor we want to be sure that the centrifuge is not stuck, that it's not made of plastic that would melt in contact with hot steam or be ripped apart by centrifugal force and so on. In case of markets we want the good to be a commodity (no efficient market for Rembrandt's Night Watch! ), to be scarce (no efficient market for information goods either, sorry), demand and supply to be elastic and so on. In yet another words, the fact that efficient markets self-regulate doesn't absolve us of the responsibility to keep eye or real-world markets and to make sure that they are truly efficient. Saying that the cure is worse than the disease and that regulating markets is necessarily going to make them perform worse is like saying that checking and fixing the centrifugal governor is necessarily going to mess with it and make it more likely to fail. We have solved the problem with the centrifugal governor: We may require the mechanic who handles it to have proper education, we may want to re-test them periodically to ensure that they haven't forgotten everything. We may want them to cross-check each other's work. We may promote an incentive system where less capable mechanics are pushed away from the most critical work and are replaced by more capable ones. We may as well solve the inefficient market problem. Technically, it's only a question of adding more levels of (ideally self-regulating) control on the top of the basic mechanism. Ultimately though, it requires responsible human beings watching the whole system, raising questions about it and being able to implement fixes when things go wrong. Let us consider the http protocol. That has allowed people to share their ideas around the world without any authority governing it. Does that mean that people are free to do whatever they want? No, people have to use the protocol and thus its rules and its restrictions otherwise noone will understand them. Thus the protocol itself is restrictive. Simply people have accepted that restriction because they have nothing to lose or there is no other protocol that they can use that would allow them to share information. If each protocol introduces restrictions, doesn't the person that makes the protocol have power over the people that use it in the sense that it induces certain behavior by its users? In other words, whether we have a person that governs us or a person that builds a protocol that determines our behavior, it is the same thing. The protocol has one advantage. It allows the reduction of the cost of group organization. Thus using a protocol is a better way. In conclusion, we need to judge both protocols and governors from the properties they give on the organization of Society. For example, if the market is creating unemployment or poverty, we need to search for a new protocol. Most libertarians accept all protocols simply because they are protocols. That is why I am not a libertarian as well. Seconded. Whatever has power over us, be it people or policies, including policies meant to guarantee free markets, should have a system of checks to ensure that there are no harmful side effects or breakages. The only thing that count today is profit. To get profit, you need performance. To get performance, you need control. To get control, you need propaganda. It's a regime, we live in a invisibile cage, called consumism and capitalism. We waste our time to work, in order to buy things. And then buy the new things. And loop forever. So we are slave, and the masters are happy. In order to break this, USA must collapse. USA is the cancer now. It has to fall. 2000 crashed, 2008 crashed, 2016 will be next stop. It must be a big crash, so that USA will be forced to start a world war in order to "get it back". In that precise moment, Europe must be closed as a bunker, close TTIP, embargo everything, never go war, exit NATO, so USA (and all their friends India, China, all the capitalistic societies) will epic fail crash, and won't get back for 100 years.